The truth on social media, business, tech, entertainment, lifestyle and world news from Rosepgraham.com, the top resource for digital culture. Kano State-based politician and a Second Republic lawmaker, Dr. Junaid Mohammed, has reiterated his claim of nepotism against President Muhammadu Buhari, stating why he must not be returned in 2019. Charles Khiran is recognized as an authority in the areas of leadership, entrepreneurship, inspiration and empowerment. Many people speak to give their audiences a warm feeling, not Charles. He speaks to transform! Long after the event audiences are still reeling from the impact of his words in their minds and hearts which inspires them to take action. Charles is a keynote speaker of conviction and leaves his audience in awe. He has won high praise from the great to the most humble in society who clamour to express their appreciations. He speaks with uncommon knowledge and wisdom, with the ability to handle difficult subjects with skill and simplicity. As an entrepreneur Charles has experienced many losses, much pain and business failures including bankruptcy over the past two decades. He has never allowed those failures to stop him advancing and failing forward. This is why he has an unusual connection with his many audiences as he connects intuitively with them, whether royalty, government ministers, State Governors, Business titans, Civic or Church leaders. As an entrepreneur Charles has reached the top of his profession in several of his many business exploits. 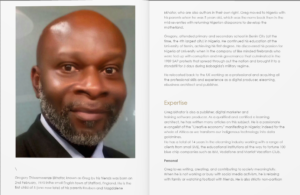 As a multi-level marketing professional he experienced his first real success over 23 years ago, he reached the ‘top of the table’ with two separate companies achieving stunning success by developing teams of high performing leaders and entrepreneurs of over 30,000 – 40,000 people in his business. From America, Middle East, Africa and across Europe, Charles continues to impact lives.